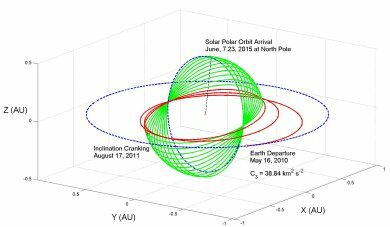 The Solar Polar Orbiter (SPO) Technology Reference Study (TRS) examines the feasibility of a mission to obtain true solar polar orbit at an altitude of less than 0.5 AU to perform remote sensing of the Sun and in situ measurements of the surrounding environment. The Solar Polar Orbiter consists of a single spacecraft, launched on a Soyuz Fregat 2B from Kourou, French Guiana. The spacecraft will utilize a solar sail to lower its orbit to less than 0.5 AU before raising its inclination. 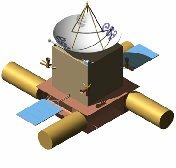 After about 4 years the SPO spacecraft will achieve an inclination of approximately 83 degrees in the ecliptic coordinate frame. At this point the sail will be detached in order to perform undisturbed scientific measurements. The preliminary concept for SPO employs a square solar sail with a total area of approximately 25 000 m². The characteristics of the sail are given in the table below. The preliminary mass budget is given in the table below, outlining the spacecraft and payload masses. 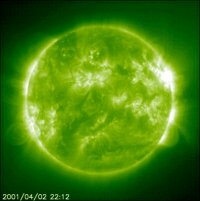 Solar Sail Material: A lightweight material needs to be developed with the required optical properties to reduce system mass and requirements. The optical properties of the sail must also be preserved during the sail phase. Solar Sail Deployment: The development of a lightweight deployment structure for a very large (~30 000 m²) sail is required. Lightweight booms: Developments of lightweight booms with a length approaching 100 m are required. Such booms should have a specific mass of less than 100 g/m. Solar Sail Attitude Control: There are several options for performing attitude control. The options currently under consideration include a gimbaled boom between the sail and spacecraft, moving masses along the boom structure, and tip vanes or thrusters on the booms. Solar Sail Jettison Mechanism: The sail must be jettisoned upon reaching the final orbit in order to prevent interference with the instruments. This separation must take place with a minimum risk of collision. This study was completed in 2004. It was carried out by SRE-PAM with the assistance of the University of Glasgow.